The average price of gas in the U.S. dropped over 5¢ per gallon last week, virtually repeating the price drop from the previous week. That brings the overall decline in gas prices over the past 14 days to 11¢. Currently, the average gas price is $3.35 per gallon, according to the latest survey from the Energy Information Administration. Except for an interruption in price declines the week of September 1, the current run of gas-price declines is nearly three months long. The average price of fuel for U.S. has plunged by 35¢ per gallon since the beginning of July, when prices were at their summer peak of $3.70 per gallon. For drivers across the U.S., regional gas prices fell virtually in lockstep with the previous week’s declines. The Midwest, for instance, experienced a second week of price dips of 8¢ per gallon. The average price of gas across the nation’s mid-section is now $3.28 per gallon, making the third U.S. region to have gas prices break below the $3.30 mark. 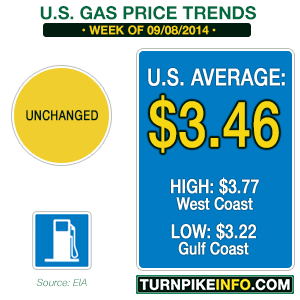 The Lower Atlantic states eased through that barrier last week with prices at $3.29 per gallon. This week, drivers in the Lower Atlantic states are paying an average of $3.26 per gallon, although prices in many urban centers are much higher. Meanwhile, the low spot for gasoline in the U.S. remains the Gulf Coast, where prices dropped to $3.13 per gallon this week. The cost of gas has been following the downward trend in crude oil prices. West Texas Intermediate, the domestic crude benchmark, was trading near $105 per barrel in mid-summer. Currently, WTI is trading just under $92 per barrel, and intraday trades have flirted with the $90 mark a number of times during the past week. Brent Light Sweet Crude, the overseas benchmark, was trading near $113 per barrel as recently as three months ago. Brent was trading just under $97 per barrel at 1 p.m. Tuesday, the lowest the futures index has been in the past 15 months. The good news for drivers of regular cars extends to drivers of America’s tractor-trailer rigs. Truckers are paying less for diesel this week than last, with the average price of a gallon of diesel down to $3.78 per gallon. As with last week, the year-over-year prices are off more than 17¢ per gallon. The average U.S. price of a gallon of gasoline took a sizable drop during the past week, according to the latest survey from the U.S. Energy Information Administration. The latest E.I.A. fuel price survey shows the nationwide average for a gallon of regular unleaded is down to $3.41, a week-over-week drop of more than 5¢ per gallon. Some regions enjoyed a more substantial price dip. For instance, Midwestern drivers found their average cost of gas was down by about 8¢ per gallon to $3.36. For drivers along the Gulf Coast, this week’s price drop pushed the cost of a gallon of gas below the $3.20 mark for the first time since February 17. The nation’s most expensive region continues to be the West Coast, where gas prices remain stubbornly high. The average driver along the Pacific rim is paying about $3.74 per gallon, but that is well below the peak prices suffered in the heat of summer, when the cost of gas was regularly above $4.00. Truckers are experiencing a noticeable decline in prices, too. 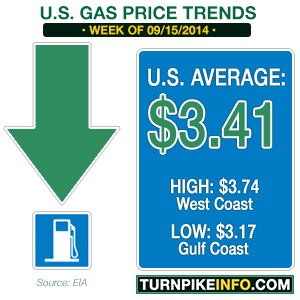 The last official week of summer begins with the average price of diesel at $3.80 per gallon. That is down from last week and off more than 17¢ compared to the same period a year ago. Truckers along the West Coast are, like their gas-powered counterparts, paying the most for fuel. Diesel is currently averaging $4.01 per gallon on the West Coast. The least expensive region is the Gulf Coast, where diesel averages $3.71 per gallon. The price of a gallon of regular unleaded remained the same during the past week, at least when viewed at the national level. Regional prices were down for some, particularly on the West Coast of the United States, but the national average remained at $3.46 per gallon, according to the latest price survey from the U.S. Energy Information Administration. This week’s E.I.A. report shows the cost of fuel barely moved for drivers east of the Rocky Mountain states, although there was about a penny decline in prices for drivers in the Lower Atlantic states, the only region in the east that enjoyed a decline of any significance. 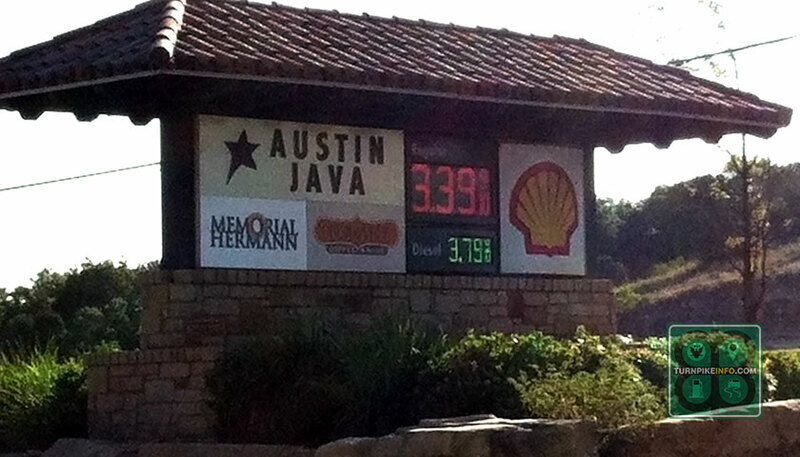 Prices at this Austin-area gas station are higher than their Gulf Region counterparts, but gas prices at this station have been the same for a couple weeks. For others in the region, gas prices went up slightly, although the Gulf Coast still remains the cheapest place to buy gas. Photo: Kristen Scallion. For drivers across the Midwest and the Gulf Coast, the cost of gas slipped up about a penny. The average along the Gulf Coast is still about $3.22, however, because price changes are measured to the thousandths of a dollar before being rounded to the nearest penny. Gulf Coast gas prices remain the lowest in the nation. The cost of a gallon of diesel did not budge in this week’s survey, at least at the national level. Diesel remained priced at $3.81 per gallon, although prices in six of the eight major survey areas shows prices beginning to move upward. The cost of diesel had been coming down for the past several weeks, albeit slowly. This week’s survey is the first time diesel prices have notched up for so many regions since the end of June, when the national average was about 11¢ per gallon higher. Crude oil prices, which had peaked at the end of June, have continued to decline dramatically in the past eight weeks; however, prices have notched up on two separate occasions in the past week. Even so, West Texas Intermediate, the domestic oil future, was trading down again Tuesday to it’s lowest levels since January. Bloomberg News was citing an ample supply of overseas oil as contributing to speculation there would be weaker demand for U.S. oil, pushing prices down. Bloomberg cited the current selloff of Brent Light Sweet Crude, along with other E.I.A. reports, in its own assessment. Meanwhile, the U.S. crude oil inventory report is due Wednesday, which Bloomberg reports is likely to show inventories shrank during the past week. Recent speculation about domestic inventories is the reason WTI has popped twice in the past week, and at least one investor quoted by Bloomberg said WTI will likely remain strong against Brent, particularly in the wake of some pipeline issues that are restricting the movement of crude oil supplies to storage and refinery destinations. That has the potential to at least prevent U.S. gas prices from going down significantly over the next couple of weeks. Current futures contracts are for October delivery. The cost of a gallon of regular unleaded ticked up slightly at the national level during the past week, according to the latest weekly fuel survey from the U.S. Energy Information Administration. The E.I.A. 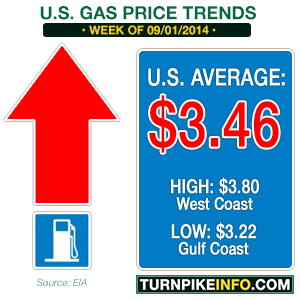 report shows the national average cost of a gallon of gas notched up from $3.45 last week to $3.46 this week. However, many regions enjoyed noticeable price declines, even as the national average gas price edged upward. On the West Coast, where prices have spent a good portion of the year above $4.00, the average price of gas is now $3.80, down nearly three cents since last week’s survey. The Gulf Coast also enjoyed a measurable drop in prices; the average price of gas from Texas to the Florida panhandle is now $3.22, the lowest in the nation. While many of the nation’s drivers enjoyed a dip in gas prices, drivers across the Midwest watched prices surge nearly 4¢ per gallon. The price hikes across the nation’s mid-section were lead by a steep increase in average prices for Ohio drivers. The Buckeye State’s average per-gallon gas price is now $3.55, up sharply from $3.42 only a week ago. Illinois also suffered a stiff price increase, but not as sharp as Ohio. Nonetheless, drivers in the Chicago area are paying 9¢ per gallon more for gas this week than last. The average price in Chicago is $3.68 per gallon, up from $3.59 last week. The price of diesel is holding steady or declining for truckers across the United States. The weekly E.I.A. survey shows the average price of a gallon of diesel, nationally, is $3.81, down from $3.82 last week. The region with the lowest price is, like regular gas, the Gulf Coast. The average diesel price across the Gulf is $3.72. The region with the highest price is the West Coast, where prices went up about a two cents per gallon last week, although California diesel prices actually went down. Take the Golden State out of the equation, and West Coast prices actually went up by more than a nickel per gallon. All told the West Coast average is about $4.03 per gallon.